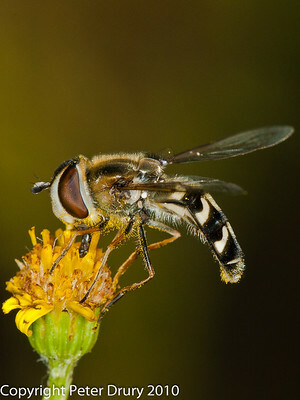 Hoverflies belong to the True Fly (Diptera).Order which includes insects with one pair of wings which are used for flight The second pair are still present but greatly reduced in size and provide stability in flight. 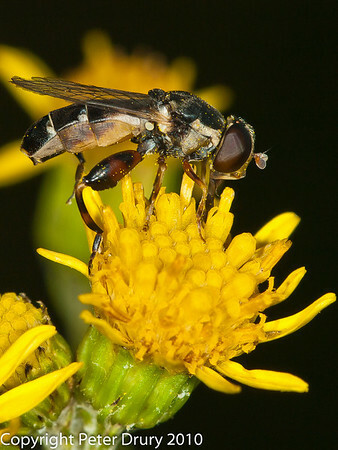 All hoverflies are in the Syrphidae family. 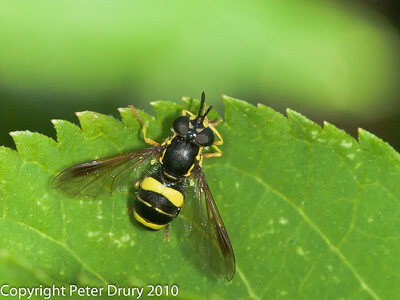 The hoverfly is usually black and yellow to mimick the bees and wasps in appearance. A useful adaption as these are nature’s warning colours and they help to ward off predators. Hoverflies are completely harmless. The following hoverflies were photographed at West Hayling LNR. If you are interested in seeing more images of many different types of Hoverflies, I would invite you to visit the Hoverfly gallery.